Making Halloween Spooktacular for Pets! That chill is in the air. The leaves are falling from the trees. In a few short hours, the night will be alive with ghosts and goblins around every corner. Shouts of “trick or treat” will be heard around the neighborhood. Indeed, Halloween is here! With Halloween upon us, you are probably ready for the big night! However, there are a few things to keep in mind concerning animals and Halloween. Even though we love this holiday, it is not always a pet friendly one. Halloween Candy. One of the best things about Halloween is the awesome candy! Yes parents, even you must admit to nabbing a piece of candy or 10 from your kids’ stash. Don’t worry, we are not judging. We all do it too. However, all that candy can be mighty tempting for your dogs and cats as well. Be sure to keep candy up and away from where pets can get into it. Although chocolate is the worst (and can even kill animals in large amounts), too much of any candy is not good for pets and can cause upset stomach, vomiting and diarrhea. Candles. Both in pumpkins and in the open, candles can be a hazard to your pet. Often, candles burning in jack o’ lanterns create a wonderful aroma that just begs a pet to come and investigate. This can lead to singed whiskers at best and severe burns in the worst cases. Be sure that the pumpkins are placed where your dog or cat cannot access them. Also be careful of placing candles in open areas where they can be knocked over by the dog or cat. In addition to painful burns from the flame or wax, this can also start house fires. Costumes: Everyone loves a cute dog or cat in a costume. But keep in mind; sometimes your dog or cat is not as happy with the prospect of dressing up. If you do decide to put them in a costume, be sure that they can move freely, the costume does not have small pieces that can be chewed off and ingested and that it does not impair their vision. Also, before you put any kind of dye or coloring on your pet, be sure to check with your vet. Even if it claims to be non-toxic for humans, this is not always true of animals. And one last warning pertaining to costumes; If you decide to take your dog trick or treating with your kids, be aware that all the little ghouls and goblins running around, crazy on sugar, might be a source of anxiety for your pup. Some dogs react with fear and others can get aggressive, so be prepared. Glow sticks and glow jewelry. Over the past several years, glow sticks and glow bracelets and necklaces have become a staple for the Halloween holiday. Parents give them to their kids to make them more visible and kids love them because they look cool. Cats and dogs love them because they make fun chew toys. Though the contents are not usually life threatening if consumed, they can cause pain and irritation in the mouth. Therefore, do not leave them lying around where your pets can get to them. As with all things pet related, knowledge is key. Knowing what things to be aware of and what to avoid this Halloween can make it happy hauntings for everyone! Thunder, Lightning & Fireworks Oh My! Summer is in full force! Hooray! However, summer comes with its own obstacles for our pets. Whether it is thunder and lightning or fireworks, this time of year can be very tough on those of our pets that are sensitive to loud noises. Animal shelters across the country see an increase in numbers right around the 4th of July due to run away pets spooked by fireworks. You might think that your animals are safe inside, but pets have been known to jump through screens and even pull a Houdini and escape the house when scared from loud noises. We have compiled a list of ways you can ease your pet’s stress level during both storms and fireworks. Know your local fireworks schedule. Try to find out when the fireworks shows will be happening so that you can be prepared. Also, stay tuned to the weather channel. Though we all know that weather forecasters have been known to be wrong at times, it is still a good idea to try and know when storms are going to be coming through your area. Provide a soothing, safe place where your pet can ride out the storm or fireworks. This can be a bathroom, a kennel, a basement, ect. Any place that is comfortable, safe and away from the outdoors will work. If you have outdoor pets that you know are afraid, it is never a bad idea to bring them in for the duration of the fireworks or until the storm blows over. Make the room or kennel comfortable and inviting. Add blankets, their favorite pillow or bed and water for hydration. If you are preparing a space for your cat, be sure to add a litter box. It sometimes helps to leave a radio or television on to drown out the noise of the thunder or fireworks. The same goes for lighting. Having lights on generally makes your pet feel safer rather than being scared in the dark. If possible, try and stay with your pet. Talk in a soothing voice and continue to pet your animal and offer reassurance. Be sure your pet has proper ID with their name, your name and all other pertinent information in the case that they do get loose or run away. Sometimes you can try desensitization with your pet. Playing CD’s with storm sounds can help get them used to the noise. However, if you choose this method, be careful. You want to start softly and gradually get louder. The idea is NOT to scare your pet. It is to get them slowly used to the noise. Finally, if all else fails, talk to your veterinarian about medication. Certain anxiety medications and sedatives might be able to help calm your pet down. Summer is a great time of year. We want to keep it happy and fun. Losing a pet is the last thing we want to see happen. So, take the proper precautions and it will be smooth sailing this summer! It is officially spring and almost SUMMER! With the rising temps, we get all this glorious rebirth! Sunshine and outdoor fun go hand in hand. We, as well as our pets, will start to feel the revitalization that comes with the warmer weather. However, as with any change in season, there are things to keep in mind that might affect our furry friends this spring. The arrival of warm weather also means the arrival of those pesky fleas, ticks and mosquitoes. If you have not kept up on your pets’ preventative through the winter, be sure to get it started a.s.a.p.! Heartworm, caused by mosquitoes, is one of the most prevalent diseases in the spring. For more information on ticks and fleas, please reference our previous blog articles. Also, we are running our annual Spring is in the Air contest and you could win a three month supply of preventative! Check out our FB page for details or give us a call. With the balmy breezes and comfy temps, many people get that urge to do their annual cleaning. As you clean, be sure to keep all cleaners and chemicals out of your pet’s reach. Also, be sure to allow surfaces to completely dry before you let your pets walk on them. You want to avoid the cleaner getting on their fur and causing irritation or having them groom themselves and accidentally ingesting some. Be sure to read all labels on your cleaning products, and when at all possible, use those that are pet friendly. We all love the warm breezes that flutter through our homes in the springtime, and so do our pets. However, be sure that if you have an open window, it is properly screened. Also, be sure to check your screens for any tearing or other weakness that could allow your pets to fall through. As the grasses, flowers and trees bloom this spring, so do seasonal allergies. Many people are unaware that your pets can suffer from allergies just as humans do. Allergic reactions in your pets can range from sniffling, sneezing and scratching to life threatening anaphylactic shock. The most common symptoms are runny nose and eyes and scratching. If you suspect your pets have allergies, contact your veterinarian as soon as possible. Moving from the indoors to the outdoors, spring is time of working on our yards and in our gardens. However, be sure that if you are using any fertilizer, insecticides or herbicides, your pet does not have access to these areas. They may make your lawn beautiful, but most contain ingredients that are toxic to your four legged friends. Be sure to check the label on any product you are using to see if it may harm your pets. Also, be aware of what plants you are planting in your yard. Lilies, rhododendron and azaleas are all highly toxic to pets and can easily prove fatal if eaten. Finally, now that the weather is cooperating, people and pets love to get out and walk, run, hike and play. Though these are all fantastic activities that can help your pet (and let’s face it, us too) shed those winter pounds, they do provide more chances for your pet to wander off or get lost. It is wise to keep your pet leashed if you are out of your yard. Also, be sure to have tags with your pet’s name and all of your pertinent information on their collar. Finally, we highly recommend that you have your pets microchipped (please see our previous blog article on the importance of microchipping). Keeping all of these things in mind, we hope that you, and your pets, get out there and enjoy the arrival of spring! Make the Holidays Happy for Your Pets! Well, despite the fact that the snow has yet to fly, we are well into the holiday season with Christmas just a few weeks away! The time has come for festive lights, good food, decorations and holiday cheer. There will be lots of shopping, presents, family visits and much much more! As we go about our merry way, as always, it is important that we keep our four legged family members’ safety a top priority. With all the new things being introduced to their environment, it is no wonder that veterinarians see an increase in sick pets this time of year. All that food, candy, presents, plants, ect. can be tough to resist for a lot of pets. So, check out our list below of potentially hazardous situations that you should be aware of to keep your pet safe this holiday season. We all know how beautiful the house and tree look all lit up. However, for many animals, those twinkling and often dangly lights present a temptation pets cannot resist. They bat, pull and chew at the lighted strands, often resulting in electrical burns to the mouth or even death from electrocution. If you decide to light candles for the holiday season, keep them high and in places where your dog and especially your kitty (who likes to defy gravity and get to places unseen) cannot reach. Not only can your pets get seriously burned from the flame or wax, they can also knock candles over creating a potential fire hazard for your home. Although it is not toxic, tinsel can cause serious harm and even death if consumed by your pets. Cats in particular are attracted to the shiny stuff that glitters and flutters as though alive. Once ingested, the tinsel can twist and bunch up causing intestinal blockages. Also highly tempting to your pets are the bright, shiny and colorful bulbs that you hang on the tree. Both dogs and cats have been known to consume tree ornaments. Many of these can shatter, causing lacerations to the mouth, esophagus or stomach. They also can be potential choking hazards. We all love giving presents to our family and our pets are certainly not an exception to this rule! However, be aware that if you wrap up a nice smelly bone or catnip, that wrapping paper is not going to completely mask the smell. Many cats and dogs, if left alone with scrumptious smelling gifts, will take it upon themselves to break into their presents stash (or others) and not wait for Christmas morning! This can be bad if they ingest the paper, cardboard or plastic wrapping that often are on these items. So, it is wise to wait to put those gift under the tree until that last minute and keep the room blocked if possible. Pine needles – Pine needles can cause irritation to the mouth, vomiting, diarrhea or lethargy. Poinsettias – Poinsettias can cause mouth irritation and vomiting. Holly – Holly can cause vomiting, diarrhea and depression in your pet. Mistletoe – Mistletoe can cause respiratory distress, erratic behavior, vomiting, diarrhea or even death. Finally, it is definitely the season for rich, delectable food. For many pets and people alike, the temptation can be great! But before you drop those scraps to your faithful friend, please remember that many foods can cause gastrointestinal issues at best or even death in the worst cases. 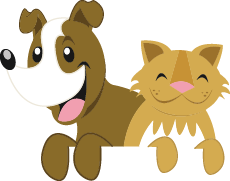 Chocolate – One of the worst offenders, chocolate is toxic to both dogs and cats alike, although worse for dogs. Stuffing – The stuffing may contain nuts and herbs that can be potentially dangerous to your pets. Cats are sensitive to essential oils and sage. Many nuts, such as macadamia, walnuts, almonds and others can cause stomach irritation, lethargy, vomiting and diarrhea. Fatty foods – Foods high in fat content, such as turkey skin and desserts can cause severe gastrointestinal issues and even pancreatitis. Bones – Many people feel that it is natural to give dogs and cats bones. However, they can cause very serious health issues with your pets and should be avoided. Bones can easily lodge in the esophagus, stomach or intestines. They can also splinter causing infection, blockages and even death if not treated. Most of our pets will sail through this holiday season happy and healthy with your help! As much as we love seeing you and yours at OAH, let’s not have it be in an emergency situation. By being aware of the potential dangers your pets may encounter, you can make a very happy home this holiday season! Resolve to make 2018 Great! Make it a point to take more walks (or jogs) with your dog. This will benefit both of you. The exercise will help all involved lose those extra holiday pounds you have been carrying and make you both healthier in general. Take a little time each day to play with your cat or dog. Even if it is just a few minutes, that time will help to strengthen the bond you share. Plus, a few minutes of playtime a day will help to lighten your mood and your pet’s too! Eating better is NOT just a resolution for humans. Your pets should not only be eating quality pet food, but they need to be eating the correct amount of it as well. If you have any questions about the kind of pet food you are using or how much your pet should be getting, be sure to contact your veterinarian and they will be able to help you. 4. Make an appointment with your vet. Just as we strive to keep our bodies healthy with annual visits to our doctor, so should your pets. Or more importantly, YOU should make it happen for them. Your pet should be seeing their vet at least once a year for an annual check up, vaccinations and flea, tick and heartworm preventatives. Many conditions such as diabetes, arthritis and obesity can be caught and treated early if your vet sees your pets frequently. This is something we hope that you are doing on a daily basis already, but maybe we can recommend flossing for you if you are not already doing that! However, you should also be brushing your pets’ teeth every day, or at least several times a week. Be sure to use toothpaste that is specifically made for cats or dogs. It might take a bit of time for your pet to get used to brushing every day, but stick with it! Also, don’t forget your pets’ annual teeth cleaning with your veterinarian! 6. Be sure your pet’s ID is up to date. If you have moved or changed any phone number, be sure this is reflected on your pet’s ID tag. Also, be sure that your vet and microchipping company have up to date information as well. If you do not have your pet microchipped, we highly recommend it! Collars can come off and tags get lost, but the success rate for finding lost pets increases dramatically with microchipping. 7. Teach your pet a new trick. This will help challenge both of you. And believe it or not, you CAN teach behaviors to your cat as well. All it takes with any pet is time, patience and a good reward system. Make it fun and it will stimulate both of your brains making for a healthier you and your pet! 8. Spend a few quiet minutes together each day. This may be one of the most important resolutions on our list! In the busy hustle and bustle of today’s world, it is easy to let time get away from us. The benefits of taking a couple of minutes each day to sit down and simply pet your dog or cat are numerous. In addition to strengthening your relationship with your pet, there are also health benefits. Studies have shown that spending time with your animals decreases blood pressure and makes people happier overall. These are just a few ways that you can get 2018 off to a ringing start! We hope this year is GREAT for both you and your four legged friends! Happy Thanksgiving…Almost! The big day is only a week away and it is time to stop and reflect on all we have to be thankful for! One of the many things that make our live complete is our pets. We love them and want the very best for them. But on a holiday where we give thanks for those furry, four legged bundles of joy, there are many dangers lurking that can cause real trouble for our pets. With all the decorating, cooking, relatives and chaos that often accompany Turkey Day, our pets can easily get lost in the shuffle. This can make for a lot of unwanted accidents. A scrap dropped here, a turkey bone left out there… these things may seem small, but they can add up to big consequences! So, here are a few things to keep in mind to help keep your pets safe while celebrating this Thanksgiving! First and foremost, there is the aromatic, juicy turkey that we all love to eat on Thanksgiving. Well, this probably is not a news flash, but our pets love to consume turkey as well. While a little nibble of turkey won’t necessarily cause any issues with your pet, you should be cautious. First, be sure that the turkey is cooked all the way through. This will save your pet (and your family) from inadvertently ingesting any salmonella bacteria. Second, be sure that if you do give any turkey to your pet, there are absolutely no bones in it. Bones can easily lodge in the esophagus, stomach or intestines. They can also splinter causing infection, blockages and even death if not treated. Your best course of action is to avoid giving your pets scraps, but we understand that this does happen. So, just be careful. Avoid giving your pets (or letting them get at) any foods that are high in fat content. This includes the skin from the turkey, gravy and any beef fat that you may be using. These high fat foods can cause severe gastrointestinal issues in pets. This includes vomiting, diarrhea, gas, bloat and even pancreatitis. When making the stuffing, be careful about what herbs you are using. They may be tasty to you, but toxic to your pet. Sage in particular is one that can cause gastrointestinal problems in your animals. Cats are particularly sensitive to essential oils and herbs, so watch them around the stuffing. Be careful of the packing that the food comes in. Nosing through the trash that smells so delightful, your dog or cat might think that they have found a treasure chest of goodies. Unfortunately, when consumed, those plastic bags, strings and other items can cause serious issues and even death for your pet. Finally, once the meal is over and dessert is served, keep Fifi and Fido away. Chocolate, in particular is very toxic to dogs. However, most of the decadent and rich desserts we eat on Thanksgiving will not settle well with your animals. Just say no when it comes to letting them sample the dessert. We want to keep our holidays festive and fun and an emergency trip to the vet does not factor into these plans! So, keep an eye on your pets, keep the food out of reach and have a very Happy Thanksgiving! Microchipping… Why is it Important? The feeling is terrifying… You realize that your beloved pet is missing. Either they tunneled out of the yard, got loose from their leash or simply wandered too far from home. Whatever the scenario is, loosing your pet is one of the worst things a person can go through. Usually the steps pet owners take when this happens are the same. Drive around looking, ask neighbors, call local vet clinics and shelters and make signs. All of these are good things to do, but you can make it much easier on yourself and your pet if this ever happens to you. How you ask? One word… Microchip. Microchipping has been around for some time, but only become mainstream in the past decade or so. The process of microchipping your pet is relatively simple. You make an appointment with your veterinarian. They will insert a chip under the skin on the back of the neck between the shoulder blades of your pet. You then register your information with the microchipping company. Now what could be easier you ask? Not much. Though there are some problems that vet clinics see every day with microchipping. When a found dog or cat is brought to a clinic, the first thing the vet will do is scan them for a microchip. However, many times, animals will come in and they will be chipped, but the owner has not registered the chip. Therefore, it is essentially useless. It is like going to a restaurant and ordering a plate of food, and then moving to a table where the server cannot find you. Why would you ever do such a thing? Another issue with microchips is that there are several different companies that offer chips. They are not universal. However, most scanners today can read all the different kinds of chips. So, unless a clinic has an older scanner, that is not really a problem anymore. Some pet owners are worried about the ongoing cost. But that too, is relatively low. Though it varies from clinic to clinic, microchipping your pet can range anywhere from $15-$75. The fee to register your information with the company also varies. While one company offers a one-time fee and no further payments, another has a yearly fee of about $18. It depends on which company your vet clinic uses. But once again, in the grand scheme of things, this cost is very low for piece of mind. So, the bottom line is this, microchip your pet and make sure to register your information. This simple act can be the difference in getting your pet back in a short amount of time, or not getting them back at all. We all know that when the weather gets warmer, we start to see a lot more pests bugging our beloved pets. As the temperatures go up, fleas can really cause your dog or cat some discomfort and give you a lot of headaches. But the question is; how much do you really know about fleas? Here are some of the biggest myths that people believe about those icky, tricky little buggers! Myth: If you only see one or two fleas, it is no big deal. Truth: A few fleas can turn into a horde of fleas in a very short time period. They breed with speed! Plus, even a few fleas can cause discomfort to your pet and no one wants that for their faithful companions. Myth: Your pet only needs preventative a few months out of the year. Truth: Although low temperatures can help keep flea infestation down in the winter, they still can flourish inside your home. Plus, any warm spells during the winter or an unusually warm spring or fall can make the flea season last much longer. To be safe, it is recommended to use preventative year round. Myth: I have never seen a flea on my pet and they are only going out in my yard, therefore I do not need preventative. Truth: Your back yard is constantly being visited by wildlife that can bring fleas and flea eggs into the environment. It is very easy for your pets to pick them up in the yard. Plus, just because you don’t see a flea, does not mean they are not there. Especially on animals with long fur, fleas can sometimes be tough to detect. Better safe than sorry! Myth: I only need to treat the animal that I see fleas on. All of my other pets are fine. Truth: If you see fleas on one pet, each and every pet in your household needs to be treated. If you treat one, but skip the others because you don’t see fleas, you are most likely going to get a reinfestation. Myth: Once I treat my pet, my job is done. Truth: The truth is you need to treat your entire home. Fleas love carpet fibers and will stay in them and multiply only to start the problem all over again. Simple vacuuming every day can help eliminate the majority of the population. Then there are treatments that can be purchased at the store. Most importantly, once you have treated your pet and home, keep your pet on preventative! That is the #1 most effective way to keep those pesky fleas out of the house! Myth: Fleas are a nuisance, but they really are harmless. Truth: Fleas are far from harmless. The can do serious damage to your pet and in some severe cases, even cause death. Some conditions that are a direct result of flea bites include: allergic dermatitis, flea anemia, cat scratch fever and tapeworm infections. Myth: I can get good flea control at the pet store. Truth: Though some pet stores have started selling more potent flea preventative, the best place to go is your veterinarian’s office. They can prescribe the best product for your pet and their lifestyle and show you exactly how to apply it. The Truth About Those Tricky Ticks! Now that we have let you in on all the flea fun, we thought it might be time to tackle those ticks! In the same way that people are often mistaken about flea facts, ticks can be tricky as well. So, here are some common misconceptions about ticks and the truth to help set them straight! Myth: The best way to remove a tick is to touch it with a lit match, cover it with petroleum jelly or nail polish. Truth: None of these old wives tales actually work to remove a tick. Actually they cause the tick to deposit more saliva into the wound therefore causing greater infection. The best way to remove a tick is to wear protective gloves, grasp the body of the tick as close to the skin as possible with tweezers and pull it out with a slow, smooth motion. Once the tick is removed, put it in an alcohol solution or flush it. Finally, clean the wound with soap, water and/or disinfectant. Myth: I don’t need to worry about ticks during the winter months. Truth: Though tick season is predominantly the months of April – November, they can be found in most states year round. Some are particularly hearty and can survive the cold, while other simply move indoors bringing them closer to you and your pets. Therefore, it is extremely important to use preventative on your pets year round. Myth: Ticks are insects, so they cannot really be that harmful. Truth: This statement is actually doubly false. Ticks are not insects. They are actually parasites that belong to the same family as mites. Ticks can cause all kinds of harmful diseases as well. From Lyme Disease, to Rocky Mountain Spotted Fever and many more, ticks are nothing to take lightly. Myth: Ticks only live in trees or wooded areas, and since I don’t live by any wooded areas, I don’t need to worry. Truth: Ticks can live on the ground in any location. They attach to a host from the grass and move their way up. Myth: If I find a tick on a family member, or myself, we can rule out all tick borne illnesses with a blood test. Truth: The truth is, for you, your family and pets, it can sometimes be difficult to diagnosis certain illnesses resulting from ticks. Sometimes it takes a few weeks and multiple blood tests to get results that are positive for the illness. It can also be difficult to tell if you are ill because many people to not experience symptoms in the early stages. The best that you can do is to contact your family physician (for humans) or your veterinarian (for pets) and do repeated blood tests over a period of weeks. As with anything in life, the key to dealing with ticks is prevention. If you are hiking with the family in an area with tall grasses, it is smart to wear long pants with high socks. Keeping your family pets on year round preventative can also stop the spread of diseases caused by ticks. The age-old saying truly holds up here… An ounce of prevention is worth a pound of cure!